Silver the Apple’s Swift programming language on Windows. NOTE: Good idea , I cannot set into Windows 10 see this (https://forums.realm.io/t/errors-in-trial-settings-elements-with-visual-studio/763/2). 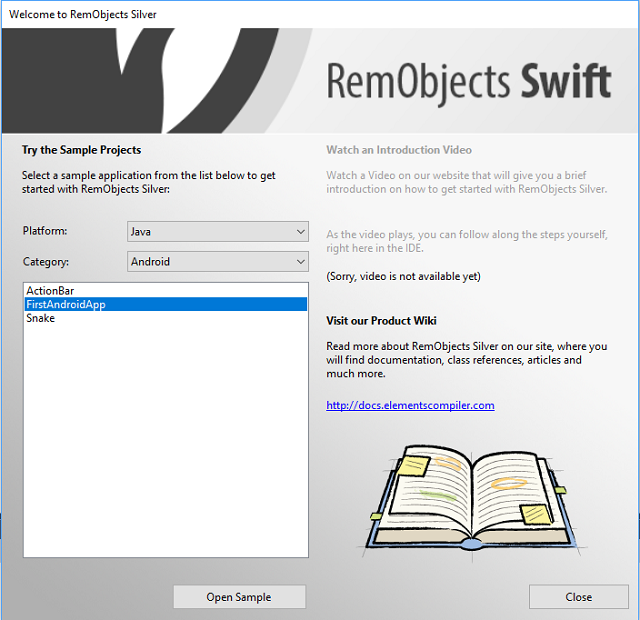 Now you can use the swift programming language to create applications on all platforms. This will working in Fire (on the Mac OS) or in Visual Studio ( on Windows OS). Silver is a free implementation of Apple’s Swift programming language. Built on over ten years of solid compiler knowledge and technology, with Silver, you can use Swift to write code directly against the .NET, Java, Android and Cocoa APIs. And you can also share a lot of non-UI code between platforms. You can purchase the full Elements package, with support for Oxygene, C#, Swift, and Java, all four platforms, and both IDEs at $799 per user. This is a screenshot about start a application for android using swift programming language.